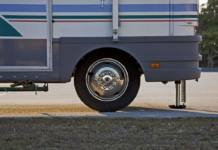 I have written a number of articles on the advisability of running trailer tires at the inflation molded on the tire sidewall. Previous articleHow about this for zipping around the RV park? I don’t understand this. My ST tires say on the sidewall “max. load 2830lbs. at max load pressure 80psi.” But my trailer loaded is only max. 2000lbs (1000lb./tire), which is only 35% of the max. load. Why would I want to put 80psi in a tire that is only carrying 35% of the max. load? Rock hard tires like that would jar the crap out of my trailer and contents and I doubt the whole width of the tread would even make sufficient contact with the road. Why would I want to do this?? ?